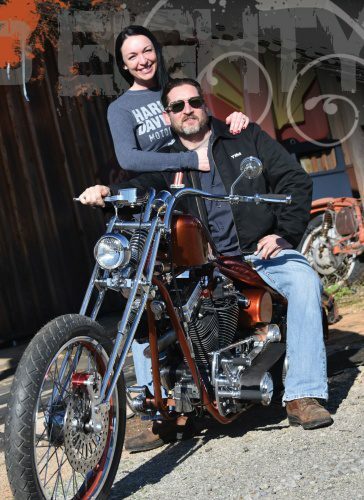 Dixon is a man who is up to his armpits in Harley iron with his shop Gas Axe Chop Shop in Ten Mile Tennessee. 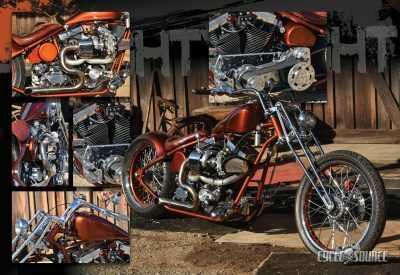 With the current number of bikes in his stable running at or near 27 bikes, the last thing he needed was another project. But that didn’t stop him from craving a turbo Evo powered bike. Everybody has that weird urge to build something but never really put the effort in because, well, it’s a novelty and not that cool old iron that keeps your shop runnin’. As chance would have it though, the project saw some light when he stumbled on a turbo Evo motor, complete from the carb in. It was brand new and ready to run, the engine was originally built by the legendary Steve Bowie and then stashed on a shelf. The original owner caught a case of life gets in the way, when he found that his wife was pregnant with twins and his project had to stop. The motor had been collecting dust and Tim was able to pick it up for less than a song and snagged the mill for less than you can buy any Knucklehead part for. 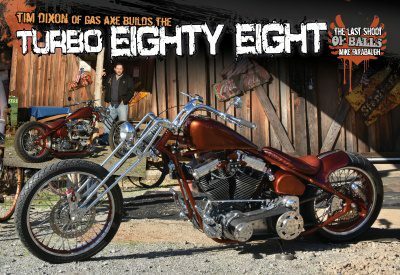 The motor itself is eighty-eight cubic inches with an estimated 10-1 compression Wiseco pistons and a turbo grind cam capped with a Garret t2 turbo and a Mikuni 42 requiring an electric fuel pump to make it all operational. The turbo itself is oiled from a ‘t’ fitting running off the oil pump to feed it and then it runs back into the cam cover. With the engine taken care of, attention was turned to the rest of the drive- train. A stock 1997 H-D five-speed is mated to the mill using an Ultima three-inch belt drive and electric starter. Shifting is by a set of swap meet forward controls of unknown origin. Tim was doin’ some wheeling and dealing with an old Ford “A” coupe and stumbled on the bikes roller. The roller was negotiated into the deal and with that became Tim’s. The frame is a gooseneck and has a rake of 34° and a stretch of roughly two inches. The frame is mated to a four-inch over girder. A twentyone- inch front wheel shod with a Metzeler 90/90/21 is used up front and an eighteen-inch rear wheel sporting a Metzeler 200/50/16 tire out back. For braking in the rear is a K.C. International sprotor was used while up front CPM rotor, and caliper was used and actuated by an eBay set of hand controls. The handlebars were made by Gas Axe as well as the stainless exhaust system you see hangin’ behind the turbo. 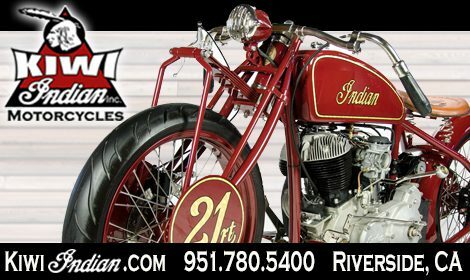 The battery needed for the electric start resides in the swap meet oil tank, and the rear fender is molded into the frame. This along with the custom sliced and stretched Sportster gas tank by Gas Axe was sent to Flamin’ Freddy for the House of Kolor root beer flake paint as the rest of the shiny stuff was sent to Atlantic Coast Plating for a dose of that bling. The front and rear lights, as well as the seat, were eBay sourced After the normal wait on shipping and cursing of the UPS man, all the flaked out, and chrome stuff arrived back at the shop. 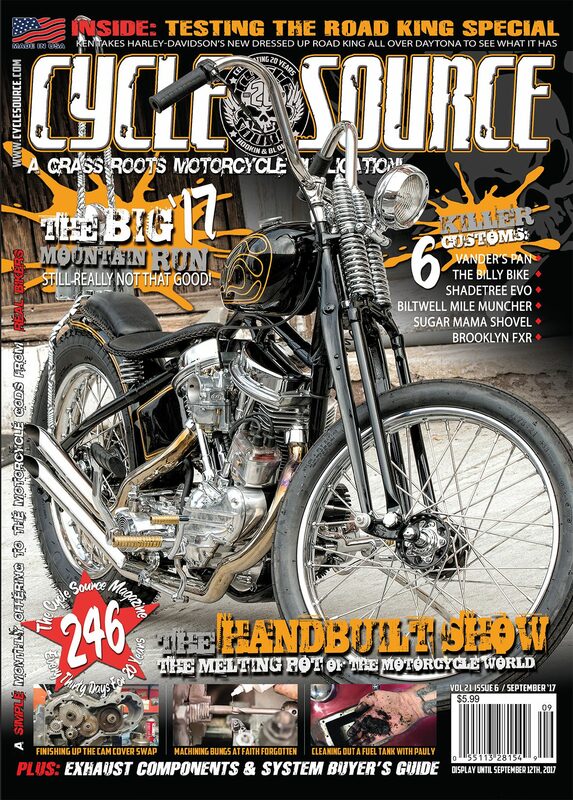 This entry was posted in Feature Bikes and tagged August 2018, Back Issue, Chopper, Custom Bike, Cycle Source, Cycle Source Magazine, Feature bike. Bookmark the permalink.